With a stay at Ocean Dream BPR in Cancun (Avenida Kukulkan), you'll be minutes from Chac Mool Beach and Forum By The Sea Mall. 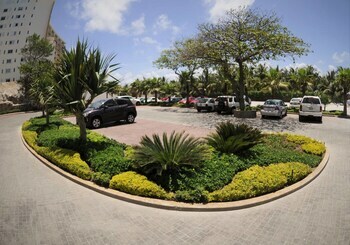 This beach condo is within close proximity of Forum Beach and Cancun Convention Center. Make yourself at home in one of the 67 air-conditioned rooms featuring flat-screen televisions. Complimentary wireless Internet access keeps you connected, and cable programming is available for your entertainment. Bathrooms have complimentary toiletries and hair dryers. Conveniences include phones, as well as laptop-compatible safes and ceiling fans. Take advantage of recreation opportunities such as a spa tub or take in the view from a terrace and a garden. This condo also features complimentary wireless Internet access and a television in a common area. Enjoy a meal at a restaurant, or stay in and take advantage of the condo's room service (during limited hours). Relax with your favorite drink at a bar/lounge or a poolside bar.